The Milwaukee 2726-20 is part of the brand’s M18 system – a collective term pertaining to power tools with 3 innovative features; namely, REDLITHIUM battery pack, POWERSTATE brushless motor, and REDLINK PLUS intelligence. If you already own a REDLITHIUM battery from another Milwaukee tool (e.g., chainsaw, leaf blower), there’s no need to get the tool+battery combo. Is the Milwaukee 2726-20 worth it? How did it fare among previous buyers? Let’s find out in this Milwaukee 2726-20 review. Aside from the 3 features mentioned above, here’s a list of other features to expect from the Milwaukee 2726-20. – Blade. 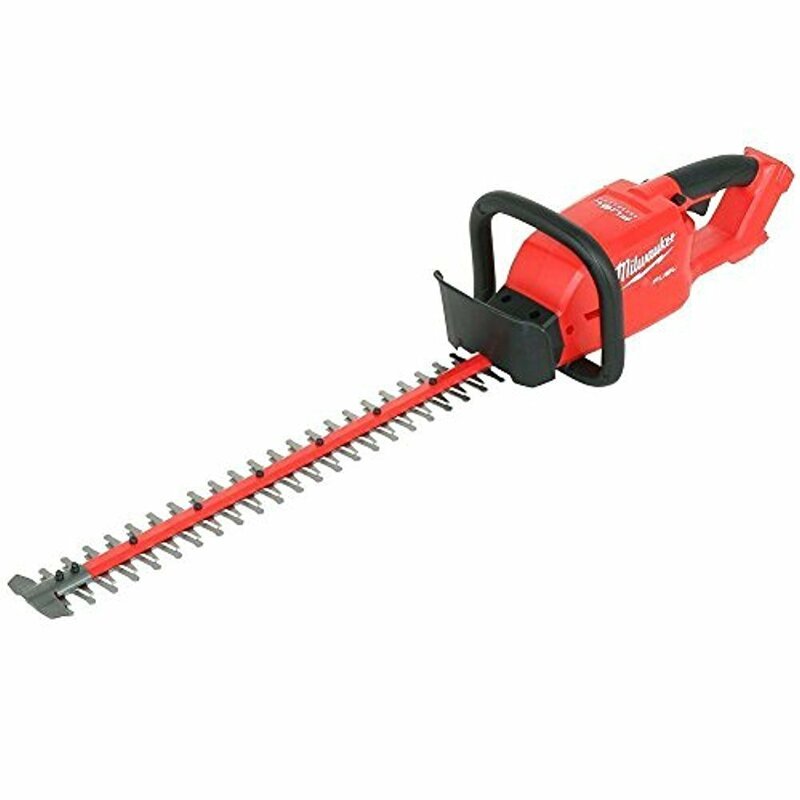 At 24 inches, the length of this battery-operated hedge trimmer‘s blade is pretty standard in comparison with other brands. It cuts 3/4-inch branches with ease, and as advertised, this trimmer is able to cut up to 30% faster with a rate of 3,400 SPM. Let’s not forget to mention that there’s a blade tip guard to prevent damage to your property. – Slider Crank Mechanism. The brand describes the Milwaukee 2726-20 as having a “robust design,” which “provides unmatched durability and longer life.” The gear case is made of an all-metal construction, and it helps protect against jobsite abuse. – Battery. With the REDLITHIUM battery pack, expect up to 2 hours of run time on a full charge. – Weight. Manufactured in China, this product weighs 8.6 lbs. Here’s a summary of what previous buyers have said about their unit. – Battery. Compared with other brands, the REDLITHIUM battery pack truly delivers a long run time. As one buyer said, she used it multiple times but the battery is still going. – Weight. Some people said that even though this unit is quite heavy, the balance is good, so maneuvering it shouldn’t be a problem. The Milwaukee 2726-20 is a well-balanced cordless hedge trimmer that cuts thick branches with ease and sculpts hedges nicely. Plus, the battery lasts a long time. Should you get one? Definitely!